As someone with limited experience on how to run a game, I'm always interested in learning more about it. Most of us just fall into the role of the Game Master and start somehow without a predefined system. But it's still a good idea to question our procedures to become better. That's why I enjoy reading blogs with Game Mastering tips, for example, gnomestew or the Alexandrian. 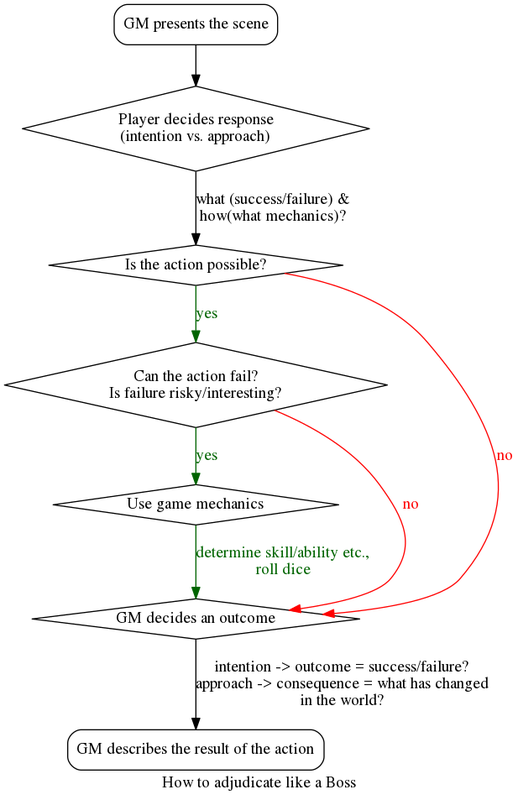 Another blog I can recommend is The Angry GM with the header "RPG advice with attitude". And that's what it is: really good information packaged into veeeery long texts and swearwords. While I'm personally not a fan of the style, the substance is pretty great. It's useful for many types of games although the author concentrates on fantasy RPGs à la D&D. One of my favorite articles is Adjudicate Actions Like a Motherf$&%ing Boss! where Angry goes into detail on how to resolve actions (skill checks and all that jazz). Be warned, it's a wall of text! For my own reference, I created a flowchart with dot. With dot, you can create charts from plain text. 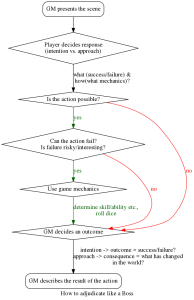 It doesn't create the prettiest graphs, but it's neat if you want flowcharts without worrying too much about making it pretty and fiddling around with a graphical interface. Plus it's easy to edit and to expand your graph if you need to. label="How to adjudicate like a Boss"
If you like Angry's article this flowchart might be useful to you. And if not, perhaps it's still fun to try dot.